We’ve seen loads of persistence of vision displays before, but this sky-writing POV display seems as though it may be a first. And we have to agree with its creators that it’s pretty cool. The idea man on this was [Ivan Miranda], who conceived of a flying POV as a twist on his robotic dot-matrix beach printer. But without any experience in RC flight, he turned to fellow YouTuber [Tom Stanton], whose recent aerial builds include this air-powered plane, for a collaboration. [Ivan]’s original concept was a long strip of Neopixels that would be attached to the underside of a wide-wingspread plane. WIthout much regard for the payload limits of most RC planes, he came up with a working display that was 3 meters long. His video below shows it in use in his shop, with some pretty impressive long exposure images. [Tom]’s part was to make the POV display flyable. He cut the length down to 2 meters and trimmed the weight enough to mount it to a quadcopter. Ungainly as the machine was, he was able to master its control enough to start painting pictures across the twilight sky. The images at the end of his video are actually stunning – we’re especially fond of Thunderbird 2, which takes us back to our childhood. DARPA has awarded an extension to AeroVironment for their work on the Nano Air Vehicle project. The prototype seen above, called Mercury, is an ornithopter which means it flaps it’s wings. It is the first to show controlled hovering. Look closely, there’s no rudder or tail. Mercury uses the two wings for both lift and control. Ornithopters themselves aren’t new, we’ve even covered them before. Usually they use the flapping wings for propulson and a tail to steer as they travel like an airplane. We would really love to see some detail shots of Mercury. The 24th annual Chaos Communications Congress in Berlin is already off to a great start. 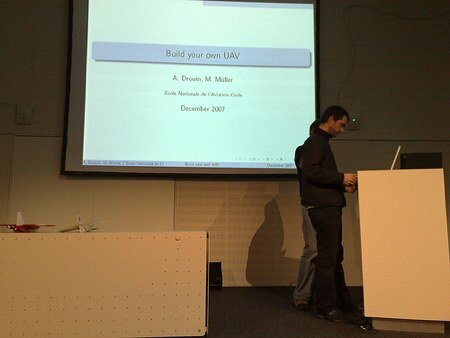 The first talk we attended was [Antoine Drouin] and [Martin Müller] presenting Paparazzi – The Free Autopilot. Paparazzi is an open source hardware and software project for building autonomous unmanned aerial vehicles. The main hardware board has an ARM processor and GPS. It uses inertial and infrared sensors to determine orientation and altitude. The four infrared thermopiles measure the air temperature. The ground is warmer than the sky and if you compare the temperature in the direction of each wing tip your can tell what angle the airplane is at. It’s really that simple. They did a pretty amazing live demo. Using the network connection they controlled a UAV flying in France and another in Germany. Both planes were streaming live video from belly mounted cameras. One relaying through a home DSL connection and the other through a UMTS cellphone. They were able to change way-points on the fly and issue flight pattern commands. There is a ground crew at each location with a security pilot that will switch the controls to manual if things get out of hand.